Ex Vietnam veteran Thomas Magnum (Tom Selleck) leaves the Navy to take up a position as private eye and security advisor to famous author Robin Masters. He is soon living the high life with use of Masters' beachfront Hawaii mansion and Ferrari. But the idyll is not all it seems. There are Higgins, Apollo and Zeus to contend with, Masters' uptight butler and his highly trained guard dogs as well as the other permanent residents at the ma..
Vietnam veteran Thomas Magnum (Tom Selleck) leaves the Navy to take up position as a private eye and security advisor to famous author Robin Masters in the cultural melting pot of 1980's Oahu, Hawaii. He is soon living the high life with Master's beachfront mansion and Ferrari, but soon the idyll is not all it seems and Magnum is drawn into the island's underworld. 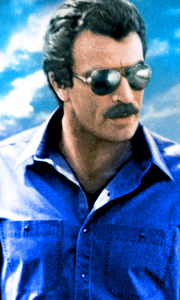 An impressive 8 seasons of groundbreaking and unconventional storytellin..
Vietnam veteran Thomas Magnum (Tom Selleck) leaves the Navy to take up a position as a private eye and security advisor to famous author Robin Masters in the cultural melting pot of 1980's Oahu, Hawaii. He is soon living the high life with Master's beachfront mansion and Ferrari, but the idyll is not all it seems and Magnum is drawn into the island's underworld. Across an impressive eight seasons of groundbreaking and unconventional sto..